With the right (semi-skilled) hands, you can turn those vegetables into a fantastic meal. 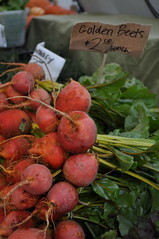 If you bought the beets and did nothing with them, however, they wouldn’t be so tasty. And if you didn’t sell them on the day of the market, there aren’t too many more market days when your customers are expecting to buy your produce and able to reach you to find it. Your ideas are perishable. This shouldn’t be a scary thing – just a fact – and you should remember the next time that you are waiting to make a decision that even if the ideas are not completely, absolutely, perfectly formed, they need to be out there in the world to be sold. So take the opportunity to put your ideas out there. Your customers might want different things than you have to sell (the esteemed Steve Blank eloquently calls this “product-market” mismatch), or they might want to buy what you have to sell. But storing your ideas for winter might leave them looking less wonderful than on market day. Previous Post Where’s your idea box? Next Post is your product line too complicated? Studiere Pharmazie in Bonn – bin sehr interessiert bei diesne Themen. Bitte bei mir melden und weiter so ! Perishable ideas or just ideas that stagnate in the bottom drawer? Thanks for your comment. Whether the ideas end up succeeding is really up to you. They can easily be ideas that stagnate, and whether that’s because they weren’t ready or because you didn’t try them it doesn’t really matter. What do you think?